Common brown rats arrived in the Pacific Northwest from Southeast Asia less than 200 years ago, and quickly made their home in our wet, mild city. And thanks to smart regulation of their favored food source (garbage), Rose City rats have lived more or less in harmony with their human neighbors. No one can eliminate rats, but we can limit their numbers. (Pro tip: get a rat terrier, not a cat.) And when you compare our small population of Rodentia to those of other cities, they look downright wholesome. Portland has a 19th-century law, still enforced, requiring that trash be kept in a sturdy container with a tight-fitting lid. In New York City and many other cities, all that’s required is a plastic bag. According to Christopher Roberts, rat specialist at Multnomah County Vector Control, Portland rats tend to live on birdseed, compost, garden produce, and pet food left outside. While Roberts has the power to fine homes and businesses with unprotected garbage, he would rather help than punish. “I just give them a sense of, ‘You can do this,’” Roberts says. OUR RATS DON’T MULTIPLY OUT OF CONTROL. Rats can mate hundreds of times a night. (Picture it.) But the lack of an abundant food supply acts as a contraceptive. So because our rats must make do with scraps from compost heaps, our rodent population won’t spiral out of control anytime soon. (An accurate citywide rat count is impossible, but Vector Control receives about 1,000 complaints a year). In a landmark 1947 study, rats fed unlimited chow multiplied until the colony broke down: males joined roaming packs instead of establishing territories; females ate their own litters. But when there’s still room to roam, as in Portland, rat society is egalitarian and family-oriented: colonies are intact, males defend females, and offspring even have room to dig their own burrows. NYC reports about 100 rat bites a year, often of sleeping children. Oregon counted just 17 rodent bites between 2010 and 2012—and none in Multnomah County. Rats usually bite only when threatened—and our rats are rarely put into situations where they’re likely to attack large animals like us, because they’re not insanely overcrowded. OUR RATS AREN’T AS DISEASE RIDDEN. Rats can give people any number of horrifying ailments: salmonella, assorted parasites, hepatitis, tularemia, bubonic plague, etc. 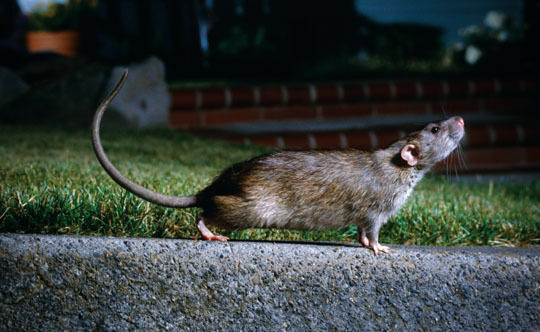 One rat-borne disease—leptospirosis, spread when an infected rat urinates in puddles, creeks, or backyard dirt—is increasing in the Pacific Northwest, according to Emilio DeBess, state public health veterinarian. But in Baltimore and New York, 90 percent of rats carry lepto. DeBess tested Multnomah County rats, and found as many as 14 percent infected with lepto.